This is the third part of the tutorial which will cover Using Azure AD B2C tenant with ASP.NET Web API 2 and various front-end clients. In the previous post, we have configured our Web API to rely on our Azure AD B2C IdP to secure it so only calls which contain a token issued by our IdP will be accepted by our Web API. In this post we will build our first front-end application (ASP.NET MVC 5 Web App) which will consume the API endpoints by sending a valid token obtained from the Azure AD b2C tenant, as well it will allow anonymous users to create profiles, and sign in against the Azure B2C tenant. 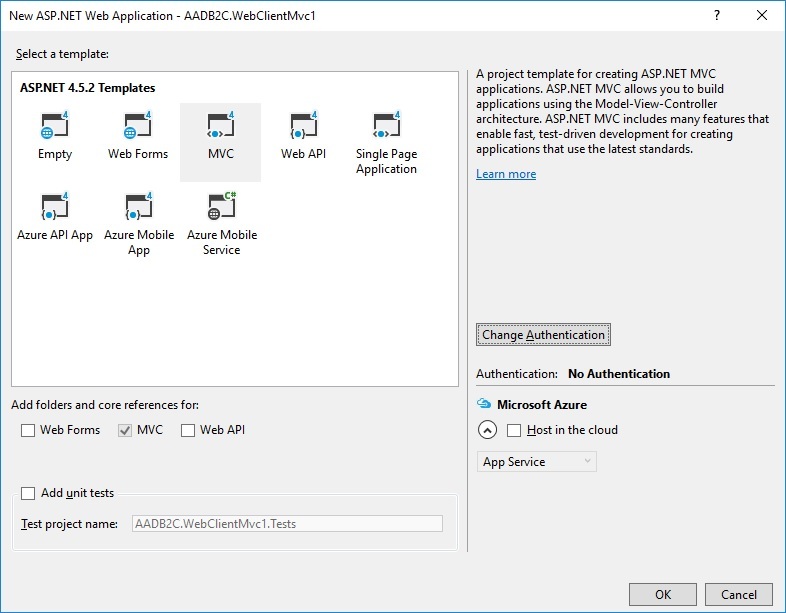 The MVC Web app itself will be protected as well by the same Azure AD B2C tenant as we will share the same tenant Id between the Web API and MVC Web app. So let’s start building the MVC Web App. The package “Microsoft.Owin.Security.OpenIdConnect” contains the middleware used to protect web apps with OpenId Connect, this package contains the logic for the heavy lifting happens when our MVC App will talk with Azure B2C tenant to request tokens and validate them. The package “Microsoft.IdentityModel.Protocol.Extension” contains classes which represent OpenID Connect constants and messages, lastly the package “Microsoft.Owin.Security.Cookies” will be used to create a cookie based session after obtaining a valid token from our Azure AD B2C tenant. This cookie will be sent from the browser to the server with each subsequent request and get validate by the cookie middleware. The usage for the each setting has been outlined in the previous post, the only 2 new settings keys are: “ida:RedirectUri” which will be used to set the OpenID connect “redirect_uri” property The value of this URI should be registered in Azure AD B2C tenant (we will do this next), this redirect URI will be used by the OpenID Connect middleware to return token responses or failures after authentication process, as well after the sign out process. The second setting key “api:OrdersApiUrl” will be used as a base URI for our Web API. 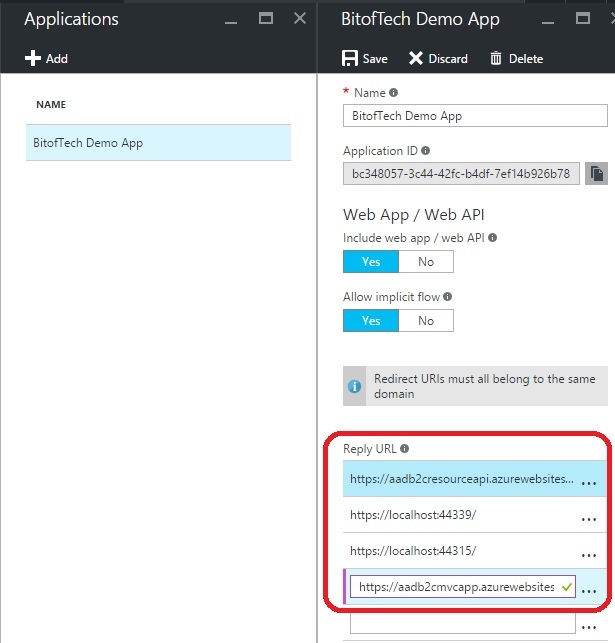 Now let’s register the new Redirect URI in Azure B2C tenant, to do so login to Azure Portal and navigate to the App “Bit of Tech Demo App” we already registered in the previous post, then add the value “https://localhost:44315/” in the Reply URL settings as the image below, note that I already published the MVC web App to Azure App Services to the URL (https://aadb2cmvcapp.azurewebsites.net/) so I’ve included this URL too. The default MVC template comes without a “Startup” class, but we need to configure our OWIN OpenID Connect middleware at the start of our Web App, so add a new class named “Startup” and paste the code below, there is a lot of code here so jump to the next paragraph as I will do my best to explain what we have included in this class. // This piece is optional - it is used for displaying the user's name in the navigation bar. From line 4-12 we have read the app settings for the keys we have included in MVC App web.config where they represent Azure AD B2C tenant and policy names, note that policy names access modifiers are set to public as it will be referenced in another class. Line app.SetDefaultSignInAsAuthenticationType(CookieAuthenticationDefaults.AuthenticationType) will configure the OWIN security pipeline and inform the OpenID connect middleware that the default authentication type we will use is”Cookies”, and this means that the “Claims” encoded in the token we will receive from Azure AD B2C tenant will be stored in a Cookie (Session for the authenticated user). Line app.UseCookieAuthentication(new CookieAuthenticationOptions()); will register a cookie authentication middleware instance with default options, this means that Authentication type here is equivalent to the same authentication type we set in the previous step. it will be “Cookies” too. Lines app.UseOpenIdConnectAuthentication are used to configure the OWIN security pipeline to use the authentication provider (Azure AD B2C) per policy, in our case, there will be 3 different policies we already defined. The MetadataAddress property will accept the address of the discovery document endpoint for our Azure AD B2C tenant per policy, so for example, the discovery endpoint for policy “B2C_1_Signup” will be “https://login.microsoftonline.com/BitofTechDemo.onmicrosoft.com/v2.0/.well-known/openid-configuration?p=B2C_1_Signup”. This discovery document will be used to get information from Azure AD B2C on how to generate authentication requests and validated incoming token responses. The AuthenticationType property will inform the middleware that authentication operation used is the policies we already defined, so for example if you defined a forth policy and you didn’t register it with the OpenID connect middleware, the tokens issues by this policy will be rejected. The ClientId property will tell Azure AD B2C which ID to use to match the requests originating from the Web App. This will represent the Azure AD B2C tenant we defined earlier in the previous posts. The RedirectUri property will inform the Azure AD B2C where your app wants the requested token response to be returned to, the value of this URL should be registered previously in the “ReplyURLs” values in Azure AD B2C App we defined earlier. The PostLogoutRedirectUri property will inform Azure AD B2C where to redirect the browser after a sign out operation completed successfully. The Scope property will be used to inform our Azure AD B2C tenant that our web app needs to use “OpenId Connect” protocol for authentication. The TokenValidationParameters is used to store the information needed to validate the tokens, we only need to change 2 settings here, the NameClaimType and the SaveSigninToken . Setting the “NameClaimType” value to “name” will allow us to read the display name of the user by calling User.Identity.Name , and setting the “SaveSigninToken” to “true” will allow us to save the token we received from the authentication process in the claims created (Inside the session cookie), this will be useful to retrieve the token from the claims when we want to call the Web API. Keep in mind that the cookie size will get larger as we are storing the token inside it. Lastly, the property Notifications will allow us to inject our custom code during certain phases of the authentication process, the phase we are interested in here is the AuthenticationFailed phase, in this phase we want to redirect the user to the root directory of the Web App in case he/she clicked cancel on the sign on or sign in forms, and we need to redirect to the error view if we received any other exception during the authentication process. This was the most complicated part in configuring our Web App to use our Azure AD B2C tenant. Now the next steps should be simpler and we will modify some views and add some new actions to issue requests to our Web API and call the Azure AD B2C polices. // To execute a policy, you simply need to trigger an OWIN challenge. What we have implemented here is simple, and it is the same for actions SignIn , SignUp , and Profile , what we have done is a call to the Challenge method and specify the related Policy name for each action. The “Challenge” method in the OWIN pipeline accepts an instance of the object AuthenticationProperties() which is used to set the settings of the action we want to do (Sign in, Sign up, Edit Profile). We only set the “RedirectUri” here to the root path of our Web App, taking into consideration that this “RedirectUri” has nothing to do with the “RedirectUri” we have defined in Azure AD B2C. This can be a different URI where you want the browser to redirect the user only after a successful operation takes place. Regarding the SignOut action, we need to Signout the user from different places, one by removing the app local session we created using the “Cookies” authentication and the other one by informing the OpenID connect middleware to send a Sign out request message to our Azure AD B2C tenant so the user is signed out from there too, that’s why we are retrieving all the Auth types available for our Web App and then we pass those different authentication types to the the “SignOut” method. Now we want to add actions to start invoking the protected API we’ve created by passing the token obtained from Azure AD B2C tenant in the “Authorization” header for each protected request. We will add support for creating a new order and listing all the orders related to the authenticated user. If you recall from the previous post, we will depend on the claim named “objectidentifer” to read the User ID value encoded in the token as a claim. // If the call failed with access denied, show the user an error indicating they might need to sign-in again. We have added an [Authorize] attribute on the controller so any unauthenticated (anonymous) request (Session cookie doesn’t exist) to any of the actions in this controller will result into a redirect to the Sign in policy we have configured. Notice how we are reading the BootstrapContext from the current “ClaimsPrincipal” object, this context will contain a property named “Token” which we will send in the “Authorization” header for the Web API. Note that if you forgot to set the property “SaveSigninToken” of the “TokenValidationParameters” to “true” then this will return “null”. We are using HTTP Client to craft the requests and call the Web API endpoints we defined earlier. There is no need to pay attention to the User ID property in the MVC App as this property is encoded in the token itself, and the Web API will take the responsibility to decode it and store it in the Azure table storage along with order information.